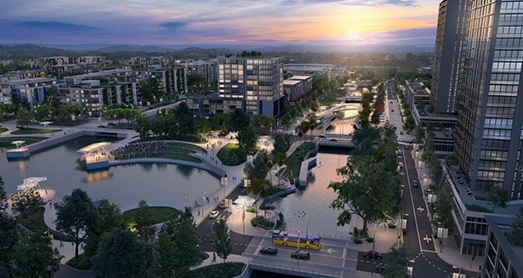 The report by Bernard Salt, The Activated City: Imagining the Sunshine Coast in 2040, found 550,000 people will be living in the region by 2040, attracted by its entrepreneurial spirit, ‘hipster’ culture and connectivity. An influx of ‘footloose’ businesses able to relocate thanks to technological change and attracted by the Sunshine Coast’s enviable lifestyle and environment. A diversification of the economy into sectors including technology, aviation, renewable energy and professional services. New flight connections with major Asian-Pacific cities, which will boost exports, increase tourism and drive the growth of high-quality education and health services. Growth of the already strong entrepreneurial sector, driven by ‘Second Generation CEOs’ – baby-boomer retirees still keen to put their money and skills to work. An increase in ‘knowledge workers’ and tech-savvy young people, attracted by higher education expansion and the emergence of new start-ups. The subsequent rise of a thriving ‘hipster’ culture and the emergence of the Sunshine Coast as a significant artistic and cultural hub. A huge increase in population from around 350,000 today to 550,000 in 2040, with young families and children among the fastest-growing demographic groups. $33bn economy by 2033, with 100,000 new jobs in high-value industries, 20 per cent of our goods and services exported and household incomes above the Queensland average.